Glacier Park Photographer: Bakken Oil Train - a ticking time bomb for East Glacier Park School Children? Bakken Oil Train - a ticking time bomb for East Glacier Park School Children? I'd like to draw your attention back to the Bakken Oil Train issue. Elizabeth Royte, a writer for OnEarth Magazine managed to find the time to draw attention to the issue of "Bakken Oil Trains," and the communities around Glacier National Park. By "Bakken Oil Trains," I'm talking about the Burlington Northern line and the oil swollen tanker cars full of the very volatile Bakken Oil that pass just a few thousand feet from my house every day. . .
Elizabeth's does a great job researching the subject and pulling together relevant issues, like the lack of fire protection, and the presence (or better, the lack there of) of a complete emergency response plan that includes the fire department in East Glacier Park and the National Park Service in any real way. Here's a link to her article, "An Accident Waiting to Happen." I would like to point to a couple of things that are missing from her piece. First, East Glacier Park school (K-8) is only feet away from the train line. 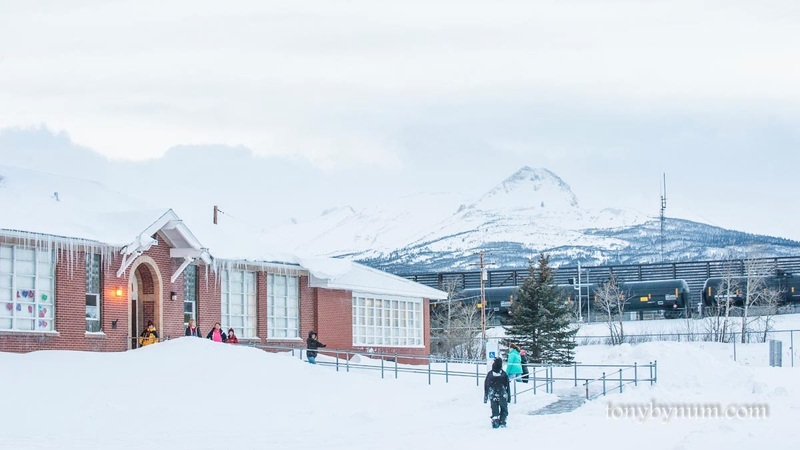 The photograph below show you just how close the Bakken Oil Train passes the East Glacier Park School. For those that have not been here, the location of that train in the photograph, is the exact place where only a few years ago, Burlington Northern dumped a pile of train cars into Midvale Creek - yes, in that exact location! Second, the risk of catastrophic fire that if started would likely take out Glacier Nation Park. Surly based on the general wind patterns which can gust to over 100 mph and often do, a crash, or accident, derailment, whatever you want to call it, between east glacier park, and west glacier park, could literally start the catastrophic fire that would sweep north east, burning the park from one side to the other. The real issue is how much work is BNSF doing to reduce the risk, and is it enough to avoid a catastrophic failure? Mother earth is often in control in these parts. I know even if BNSF does it's best - whatever that is - mother nature still rules this land of ice, snow, wind, and beauty . . . Please take a look at Elizabeth's piece, "An Accident Waiting to Happen." Let us know what you think or if you have any good ideas about how to reduce the risk of a catastrophe.